"I am the cold steel...the blade that will restore balance to this world! Nox Nyctores, Yukianesa, activate!" Major Jin Kisaragi (ジン＝キサラギ), also known as the Hero of Ikaruga (イカルガの英雄), is one of the main characters of the BlazBlue series. He is the current wielder of the Nox Nyctores - Mucro Algesco: Yukianesa and is a product of Order. 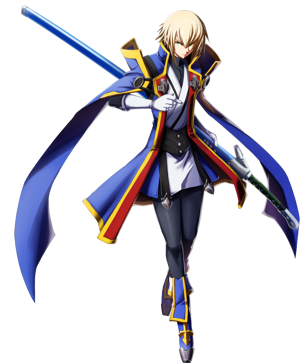 Jin is the younger brother of Ragna the Bloodedge, older brother of Saya, and a member of the Duodecim's Kisaragi household. 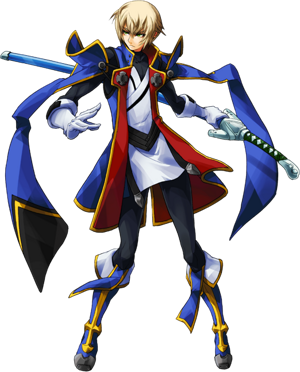 Jin is one of the original playable twelve characters who debuted in BlazBlue: Calamity Trigger. Jin is a slim yet muscular young man with fair skin, short, blond hair, and green eyes. He wears the blue uniform of the NOL infantry division. His uniform consists of a sleeveless blue coat with red lining and gold trimmings, a sleeveless white tunic secured at the waist with three black belts, and underneath everything a black form-fitting, full-length bodysuit with long sleeves. He wears a pair of thick, long, white gloves folded over just below his elbows. Detached, long blue strips of cloth are attached to his coat by a pair of large silver buttons near his shoulders. They end in black triangles with a single gold stripe on the outside, while the inside remains completely blue. These sleeves reach down to his knees and also have large pauldrons. Jin also wears the standard blue NOL infantry boots, which bear gold trimmings, a gold cross along the tongue of the boots, and silver metal toes. During his time at the Military Academy, Jin wore the standard male school uniform, a pair of white shoes, and grey glasses. It is unknown if Jin had problems with his eyesight around this time or if he wore them for purely aesthetic reasons. When he fought in the Ikaruga Civil War, Jin wore a variation of his NOL uniform, donning a sleeveless blue coat with red lining and gold trimmings, with a matching pauldron fastened to his uniform by a metal plate engraved with an unknown symbol, a sleeveless white tunic over a sleeveless black undershirt, metal arm guards and fingerless gloves, white trousers and boots trimmed in blue and gold. When he was young and still lived at the church with Ragna and Saya, Jin often wore a pale blue jacket, a black shirt, light brown trousers, and dark brown shoes. On the night the church burned down, he was wearing a light blue shirt and black shorts. In his teenage years after he was adopted by the Kisaragis, Jin wore a traditional Japanese attire consisting of a white kosode (shirt), blue hakama (trousers), white socks and sandals. For important ceremonies, Jin wears a more formal version of his NOL uniform consisting of a sharp blue suit with black cuffs, gold trimmings, and a large shoulder cloth with various insignia sewn upon it, as well as a white shirt, red tie, a pair of white trousers, and the standard blue NOL infantry boots with gold trimmings. 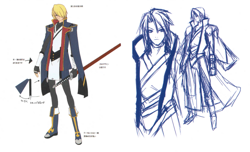 On certain occasions he has also worn a blue beret or a NOL cape similar to Kagura's but in blue. Calm and collected, but also somewhat aloof when it comes to other people. He's an exceptional soldier and commander, but also ambitious and jealous, which makes him extremely possessive. To most, Jin is apathetic, cold, distant, and aloof, barely showing any emotion to anyone. He is much more complex than most would initially think thanks to years of influence under Yukianesa and Order. He has a deep brotherly love for his brother Ragna, a love that both aforementioned factors manipulated into something twisted and corrupted. Another person that Jin has a strong attachment to is his childhood friend Tsubaki Yayoi - the two of them will do nearly anything for one another and she is one of a few people that truly understands him. In the timeline where Jin became Hakumen, Tsubaki's death haunted and wracked him with guilt for nearly 100 years. 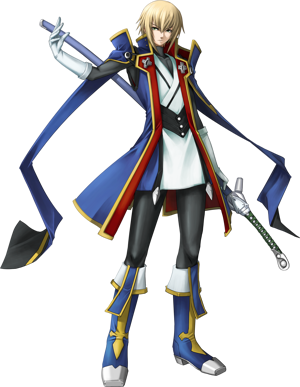 His most complicated relationship is with Noel Vermillion, someone who he despises for looking like his sister. As time goes on, however, he begins to become softer towards her. Prior to gaining control of Yukianesa, Jin was prone to emotional and mental outbursts. He would allow the Nox to control him and make decisions without his consent, attacking both friends and foes alike. Once he solidified his control, Jin began to formerly identify more with Order and to destroy anything that would oppose it. As a child, Jin was described as a "crybaby", being sensitive and extremely attached to Ragna. He was often jealous of the attention that Saya was shown and would cry whenever Ragna was ill. He was also terrified of the moon, thinking it would crash at any second; as he grew older, the fear of the moon turned into a hatred. As a teenager in the Military Academy, Jin was popular, cool, and calm, being seen as a model student by all. Born to oppose Ragna, Jin is an embodiment of Order with exceptional skills in Ars Magus. He wields his Nox, the Mucro Algesco: Yukianesa, with unrivaled skill, and utilizes it in an iaijutsu style; he keeps the blade within its sheath at most times, only drawing it to attack and defend. Jin's swordsmanship is elegant, with every strike being both precise and deliberate. He has owned the Nox all of his adult life; his control over Yukianesa's ice-related abilities allows him to create and shape water in the air and crystallize it, giving birth to a myriad of techniques. Some of the objects that Jin can create include swords of varying sizes, arrows, and beams of ice. His mere presence creates snowflakes in the air, and his Drive is Frost Bite. During the civil war, Jin managed to break through the entirety of the Ikarugan defenses by himself without killing a single person - all while being goaded into killing by his Nox. Unfortunately, Jin has lost his ability to fight per Trinity's deal - his body is unable to battle. As a Major with his own unit, Jin is likely an accomplished tactician and commander. Mori: I'm sure many know this, but part of Jin's personality is actually quite broken. However, there's meaning even though he's broken; please take a look at the Story Mode for this, and watch over Jin warmly. In the concept for his design, he wore Japanese clothing that gave off a bit of a "soldier" vibe. Different divisions of the NOL wear different colors. Even while embracing a deep darkness within him, his cold expression doesn't betray a speck of it. "Someone who should be a cool rival character" in one picture. Jin's crest is in the image of a crystal of ice. In the center is a sword with Yukianesa as its motif, and scattered around it are symbols meant to evoke the image of diamond dust. Mori: Jin's personality and backstory were mostly unchanged from the very beginning, as far as being a younger brother chasing after his older brother, Ragna. While designing him, it occurred to me "the protagonist's younger brother shouldn't give off such an uptight feeling" so his dual-wielding style was changed to a single sword; "his clothes feel like a protagonist's, doesn't it seem like it would fit right in as the uniform of an enemy force from an old robot anime?" so I returned to the roots of his concept and tried out a design using the image of the Shinsengumi. There were quite a few changes in direction. If I were to consider [the process of] Jin's design altogether, his frame gradually became thinner, letting his more feminine traits feel more natural. Since I was taking inspiration from the Shinsengumi, I wanted to design his sleeves to flap around a bit, but thinking about whether that was reflected in the game or not... in the end, it wasn't really (lol). Mori: Influenced by Star Wars, this design was based on the idea of being "uniformed and dual-wielding swords." The two beam sabers looks a little like the Jedi Knights'. He is almost always cool and composed – the keyword being ‘almost.' To most, he is apathetic and even cruel at times, but deep down he's ambitious, competitive, and lonely. According to Ragna, however, he was a little cry baby in his youth. He was adopted by one of the families of the Duodecim, the Kisaragi family, and there nurtured his talents into what they are today. He is given his own unit while still in the Military Academy, and only moments after graduating, he is sent to Ikaruga, where, his war efforts will earn him the infamous title. He will become the youngest commander of a unit that size, with the rank of major. He wins his commendations for bringing down the leader of the Federation, Tenjo; however, Jin doesn't remember the details of the event because Terumi erased parts of his memory. The mental strain placed upon Jin from his beloved Nox Nyctores: Yukianesa, causes him to behave irrationally when around Ragna. He is filled with attachment and murderous intent, often ignoring his orders to quench his thirst. After he overcomes Yukianesa's curse, he gains the Power of Order, and is able to control his will. Now under the guidance of none other than jubei, Jin sets off to free his childhood friend, Tsubaki, from the Imperator's curse. His destination? Ikaruga. Jin, Makoto and Noel encounter Tsubaki, where Jin uses the Power of Order to rid Tsubaki of her Immortal Breaker power, freeing her from the curse. Then, Jin takes a stand against the Gigant: Take-Mikazuchi, with Noel and Ragna at his side, but is gravely wounded by Ragna's hands after Ragna is affected by ν's sword. A swordsman hailed as the "Hero of Ikaruga." Calm and collected, he doesn't involve himself in others' affairs, yet still excels as a leader. Normally calm and collected, he stays focused on his mission and serves as an excellent commander, but in front of his older brother Ragna the Bloodedge, his personality undergoes a rapid change. The weapon that he wields is the Nox Nyctores "Mucro Algesco: Yukianesa". A soldier of the Novus Orbis Librarium with the rank of "Major." He is the calm and collected leader of the Fourth Thaumaturgist Squadron, and the heir to the famous "Kisaragi family" of the Duodecim, and possessor of the extremely powerful "Nox Nyctores Causality Weapon - Mucro Algesco: Yukianesa." The mobile game Mabinogi Duel stars Jin as a playable card. The MMO Action Game Lost Saga stars Jin as a playable character. The MOBA game Chaos Heroes Online stars Jin as a playable character. The mobile game Fantasy War Tactics stars Jin as a playable unit. The arcade collectible card games Lord of Vermilion Re: 2 and Lord of Vermilion 3, from Square Enix, have Jin as a card. The PSVita music app NAX Music Player has Jin as purchasable background skin. The mobile rhythm-game GROOVE COASTER 2 has Jin's theme 'Lust SIN' as purchasable track. The arcade rhythm-game GROOVE COASTER 3 has Jin's theme 'Lust SIN' as purchasable track. The MMORPG Phantasy Star Online 2, by SEGA, features Jin's outfit, hairstyle, voice (only male avatar) and weapon as customization for the player character. The iOS/Android game Medal Masters: Call of destiny has Jin as a playable character. The iOS/Android game Venus Eleven Vivid! has a character which uses Jin's outfit and signature move Musou Senshouzan (localized as Crystal Strike) for a special attack. 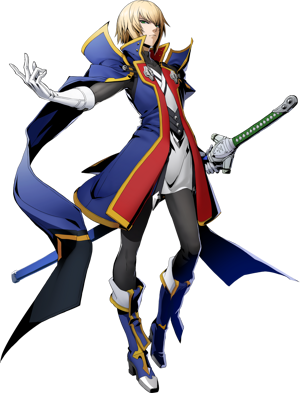 In the BlazBlue 10th Anniversary Character Poll, Jin placed 5th out of the 84 candidates. He scored one place above Mai Natsume and one place below Yuuki Terumi. He had 4589 votes. Jin has had iced fruit drinks themed after him in BlazBlue collaboration cafes: "Rengoku Hyoya (Purgatory's Freezing Night)" and "Jin's Frozen Fruit Ice Blade". Jin's moveset has a naming theme based around ice imagery. Jin's birthday is Valentine's Day, corresponding with Tsubaki's birthday being White Day. Jin is one of two characters to have canonically used their Astral Heat, with the other being Ragna. 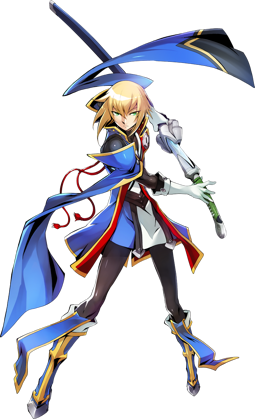 Jin has used Arctic Dungeon against Azrael in BlazBlue: Central Fiction, and Tenjo Amanohokosaka and Bang Shishigami in BlazBlue: Spiral Shift – Hero of the Frozen Blade. Unlike Ragna and Saya, Jin has no unusual marks on his body. As a child, Jin was terrified of the moon, something that Ragna would later mock him over. Hakumen's "I am the white void" speech has a hidden meaning in Japanese. The speech has the line "Ware wa Jin" (localized as "I am the just sword"), which has two meanings: "I am justice" and/or "I am Jin". Jin shares his English voice actor, David Vincent, with Hakumen.